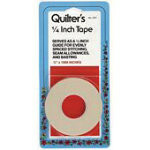 Single faced tape that will not leave glue on your fabric. Perfect for quilting 14" from the ditch. Box of 6.